Time shifts desires-and one man will regret his choice-in Tchaikovsky's masterpiece of unrequited love and missed opportunities, inspired by Pushkin's novel. Young Tatiana confesses her devotion to the worldly Onegin, but his cold refusal devastates her. Years later, when Tatiana matures, it is Onegin who begs for her love. Will Tatiana embrace the man she once longed for? Or will Onegin forever be the victim of his own bitter decision? 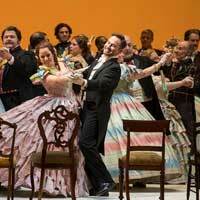 "...Washington National Opera's (WNO) Eugene Onegin is exquisite! The entire evening soars like a dream with pitch-perfect performances led by the immaculate Anna Nechaeva as Tatiana. Both intimate and sweeping, delicate and bold, this production captures the infatuation of young love with the tempered wisdom of age and loss." "...Of all the grand tear-jerkers, those epic romances that make you want to tear your heart out and roast it on the barbecue, Tchaikovsky's masterpiece Eugene Onegin stands out. Packed with beautiful melodies, misprized love, a fatal duel between lifelong friends, gorgeous dance numbers, and an evocation of Russian folk life (back when it wasn't the done thing), this opera continues to pack houses and draw the world's most talented artists."